Nepal ( [neˈpaːl] ), officially the Kingdom of Nepal, is a landlocked Himalayan country in South Asia, bordered by China ( Tibet) to the north and by India to the south, east and west. Nepal is a kingdom of various geographical features, and is culturally rich. More than 80% of Nepalese follow Hinduism, which is higher than the percentage of Indian Hindus, making it the single most Hinduic nation in the world. For a small territory, the Nepali landscape is uncommonly diverse, ranging from the humid Terai in the south to the lofty Himalayas in the north. Nepal boasts eight of the world's fourteen highest mountains, including Mount Everest on the border with China. 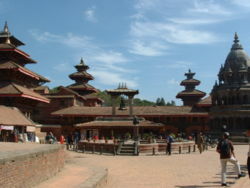 Kathmandu is the capital and largest city. The other main cities include Bharatpur, Biratnagar, Bhairahawa, Birgunj, Janakpur, Pokhara, Nepalgunj, and Mahendranagar. The origin of the name Nepal is uncertain, but the most popular understanding is that it derived from Ne (holy) and pal (cave). After a long and rich history, during which the region splintered and coalesced under a variety of absolute rulers, Nepal became a constitutional monarchy in 1990. However, the monarchy retained many important and ill-defined powers. This arrangement was marked by increasing instability, both in the parliament and, since 1996, in large swathes of the country that have been fought over by Maoist insurgents. The Maoists, alienated from mainstream political parties, went underground and started a guerrilla war against both monarchy and mainstream political parties. They have sought to overthrow feudal institutions, including the monarchy, and establish a republic. This has led to the ongoing Nepalese Civil War in which more than 13,000 people have died. On the pretext of quashing the insurgents, who now control about 60% of the country, the king closed down the parliament and sacked the elected prime minister in 2002 and started ruling through prime ministers appointed by him. He then unilaterally declared a state of emergency early in 2005, and assumed all executive powers. Following the Loktantra Andolan, the king agreed to relinquish the sovereign power back to the people and reinstated the dissolved House of Representatives on April 24, 2006. Using its newly acquired sovereign authority, on May 19, 2006, the newly resumed House of Representatives unanimously passed a motion to curtail the power of the king and declared Nepal a secular state. As of September, 2006, a complete rewrite of the country's constitution was still expected to happen in the near future. Indo-Aryan tribes entered the valley around 1500 BC. Around 1000 BC, small kingdoms and confederations of clans arose. One of the princes of the Shakya confederation was Siddharta Gautama (563–483 BC), who renounced his royalty to lead an ascetic life and came to be known as the Buddha ("the one who has awakened"). By 250 BC, the region came under the influence of the Mauryan empire of northern India, and later became a puppet state under the Gupta Dynasty in the 4th century. From the late 5th century, rulers called the Licchavis governed the area. The Licchavi dynasty went into decline in the late 8th century and was followed by a Newari era, from 879, although the extent of their control over the entire country is uncertain. By late 11th century, southern Nepal came under the influence of the Chalukya Empire of southern India. Under the Chalukyas, Nepal's religious establishment changed as the kings patronised Hinduism instead of the prevailing Buddhism. By the early 13th century, leaders were emerging whose names ended with the Sanskrit suffix malla ("wrestler"). Initially their reign was marked by upheaval, but the kings consolidated their power over the next 200 years. By late 14th century much of the country began to come under a unified rule. This unity was short-lived: in 1482 the kingdom was carved into three – Kathmandu, Patan, and Bhadgaon – which had petty rivalry for centuries. In 1765, the Gorkha ruler Prithvi Narayan Shah set out to unify the kingdoms, after first seeking arms and aid from Indian kings and buying the neutrality of bordering Indian kingdoms. After several bloody battles and sieges, he managed to unify Nepal three years later. However, the actual war never took place while conquering the Kathmandu Valley. Infact, it was during the Indra Jaatra, when all the valley citizens were celebreting the festival, Prithvi Narayan Shah with his troops captured the valley, virtually without any effort. This marked the birth of the modern nation of Nepal. A dispute and subsequent war with Tibet over control of mountain passes forced Nepal to retreat and pay heavy repatriations to China, who came to Tibet's rescue. Rivalry with the British East India Company over the annexation of minor states bordering Nepal eventually led to the brief but bloody Anglo-Nepalese War (1815–16), in which Nepal defended its present day borders but lost its territories west of the Kali River, including present day Uttaranchal state and several Punjab Hill States of present day Himachal Pradesh. The Treaty of Sugauli also ceded parts of the Terai and Sikkim to the Company in exchange for Nepalese autonomy. In the late 1940s, emerging pro-democracy movements and political parties in Nepal were critical of the Rana autocracy. Meanwhile, China occupied Tibet in 1950, making India keen on stability in Nepal, to avoid an expansive military campaign. Thus India sponsored Tribhuvan as Nepal's new king in 1951, and a new government, mostly comprising the Nepali Congress Party. After years of power wrangling between the king and the government, the democratic experiment was dissolved in 1959, and a "partyless" panchayat system was made to govern Nepal. In 1989, the "Jan Andolan" (People's) Movement forced the monarchy to accept constitutional reforms and establish a multiparty parliament in May 1991. Nepali Congress Party wins first democratic elections. Girija Prasad Koirala becomes prime minister. On June 1, 2001, the Heir Apparent Dipendra reportedly went on a killing spree in the royal palace, in response to his parents' rejection of his choice of wife. His parents were killed and he died 3 days later. Following the carnage, the throne was inherited by Birendra's brother Gyanendra. In the face of unstable governments and a Maoist siege on the Kathmandu Valley in August 2004, popular support for the monarchy waned. The seven parliamentary parties (SPA), with support from the Maoists, arranged a mass uprising against the reign of King Gyanendra. The royal government used various means to quell the uprising. Frustrated by lack of security, jobs and good governance, thousands of people took to the streets to demand that the king renounce power outright, but the royal government turned even more ferocious and continued its atrocities including daytime curfews amid a Maoist blockade. Food shortages hit people so that they prepared to march into the city centre and encircle the royal palace. The security forces turned brutal and the king seemed to think nothing had happened so far. Thousands were injured and 21 people died in the uprising, which was meant to be peaceful but turned violent due to the actions of the government and its vigilantes. Foreign pressure continued to increase on King Gyanendra to surrender power so that on April 21, 2006 Gyanendra announced that he was giving up absolute power and that "Power was being returned to the People". He called on the seven party coalitions to name a possible Prime Minister and that elections would be held as soon as possible. Many Nepalese protesters however, still carried out rallies in numerous cities and vowed to continue the stir until they would achieve complete abolishment of the monarchy. Finally after 19 days of protests, on April 24 midnight, the king called for the country's parliament to reassemble on April 28. Parliament has since reassembled and stripped the king of his power over the military, abolished his title as the descendent of a Hindu God, and required royalty to pay taxes. Furthermore, several royal officials have been indicted, and the Nepalese government is no longer referred to as "His Majesty's Government", but rather as the "Government of Nepal". An election of the constituent assembly to rewrite the constitution has been declared unanimously to be held in the near future, with the possible abolition of the monarchy as part of constitutional change. Following Gyanendra's relinquishing of absolute power, the Nepalese government and Maoist rebels agreed on a ceasefire. In August 2006, both parties came to an agreement on the issue of arms accountability, agreeing to ask the United Nations to oversee and keep track of the weapons cache of both sides. The government and the Maoists are trying to come to an agreement on the future of the monarchy. As of 21 November 2006, Maoists and the Seven Party Alliance have signed a peace deal. This will reportedly end the Nepal Civil War, which has claimed more than 13,000 lives to date. 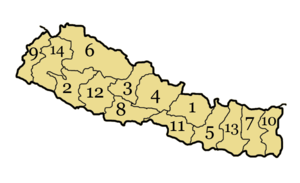 Nepal is of roughly rectangular shape, 650 kilometres (400 mi) wide and 200 kilometres (125 mi) broad, with an area of 147,181 square kilometres (56,827 sq mi). Nepal is commonly divided into three physiographic areas: the Mountain, Hill, and Terai Regions. 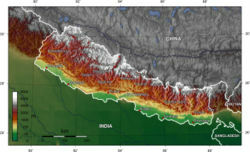 These ecological belts run east-west and are bisected by Nepal's major river systems. The Hill Region (Pahad in Nepali) abuts the mountains and varies from 1,000 to 4,000 metres (3,300–13,125 ft) in altitude. Two low mountain ranges, the Mahabharat Lekh and Shiwalik Range (also called the Churia Range) dominate the region. 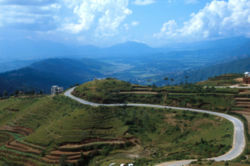 The hilly belt includes the Kathmandu Valley, the country's most fertile and urbanised area. Despite its geographical isolation and limited economic potential, the region always has been the political and cultural centre of Nepal. 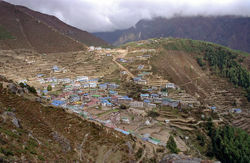 Unlike the valleys, elevations above 2,500 metres (8,200 ft) are sparsely populated. The Mountain Region contains the highest region in the world. The world's highest mountain, Mount Everest (Sagarmatha in Nepali) at 8,850 metres (29,035 ft) is located on the border with China. 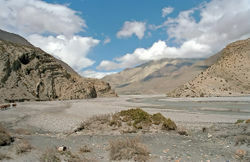 Eight of the world's fourteen highest mountains are located in Nepal. Kanchenjunga, the world's third highest peak, is also located in Nepal. Deforestation is a major problem in all regions, with resulting erosion and degradation of ecosystems. Although Nepal shares no boundary with Bangladesh, the two countries are separated by a narrow strip of land about 21 kilometre (13 mi) wide, called the Chicken's Neck. Efforts are underway to make this area a free-trade zone. Agriculture sustains 76% of the population and accounts for about 39% of the GDP; services comprise 42%, and industry 21%. Hilly and mountainous terrain in the northern two-thirds of the country has made the building of roads and other infrastructure difficult and expensive. There are just over 4,000 km of paved roads, and one 59 km railway line in the south. Aviation is in a better state, with 46 airports, nine of them with paved runways. There is less than one telephone per 46 people; landline services are poor, although mobile telephony is in a reasonable state in some parts of the country. There are around 100,000 Internet connections, but after the imposition of the "state of emergency", intermittent losses of service have been reported. Its landlocked location and technological backwardness and the long-running civil war have also prevented Nepal from fully developing its economy. The country receives foreign aid from China, the United States, Japan and the European Union. The government's budget is about US$665 million, with expenditures of $1.1bn. The inflation rate has dropped to 2.9% after a period of higher inflation during the 1990s. The Nepalese Rupee has been tied to the Indian Rupee at an exchange rate of 1.6 for many years. Since the loosening of exchange rate controls in the early 1990s, the black market for foreign exchange has all but disappeared. A long-standing economic agreement underpins a close relationship with India. Nepal's workforce of about 10 million suffers from a severe shortage of skilled labour. Agriculture employs 81% of the workforce, services 16% and manufacturing/craft-based industry 3%. Agricultural produce——mostly grown in the Terrai region bordering India——includes rice, corn, wheat, sugarcane, root crops, milk, and water buffalo meat. Industry mainly involves the processing of agricultural produce, including jute, sugarcane, tobacco, and grain. The spectacular landscape and deep, exotic culture of Nepal represents considerable potential for tourism, but growth in this export industry has been stifled by recent political events. The rate of unemployment and underemployment approaches half of the working-age population. Thus many Nepalese move to India in search of work, the Gulf countries and Malaysia being new sources of work. Poverty is acute. Nepal receives US$50 million a year through the Gurkha soldiers who serve in the Indian and British armies and are highly esteemed for their skill and bravery. The total remittance value is worth around 1 billion USD, including money sent from Arabia and Malaysia, who combined employ around 200,000 Nepalese. Nepal's GDP for the year 2005 is estimated at just over US$37 billion (adjusted to Purchasing Power Parity), making it the 83rd-largest economy in the world. Per-capita income is around US$1,402, ranked 163rd. Nepal's exports of mainly carpets, clothing, leather goods, jute goods and grain total $568 million. Import commodities of mainly gold, machinery and equipment, petroleum products and fertiliser total US$1.419 bn. India (48.8%), the US (22.3%), and Germany (8.5%) are its main export partners. Nepal's import partners include India (43%), the United Arab Emirates (10%), China (10%), Saudi Arabia (4.4%), and Singapore (4%). 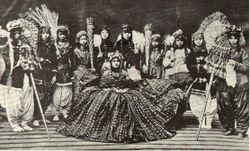 Until 1990, Nepal was an absolute monarchy running under the executive control of the king. Faced with a people's movement against the absolute monarchy, King Birendra, in 1990, agreed to large-scale political reforms by creating a parliamentary monarchy with the king as the head of state and a prime minister as the head of the government. Nepal's legislature was bicameral consisting of a House of Representatives and a National Council. The House of Representatives consists of 205 members directly elected by the people. The National Council had 60 members, 10 nominated by the king, 35 elected by the House of Representatives and the remaining 15 elected by an electoral college made up of chairs of villages and towns. The legislature had a five-year term, but was dissolvable by the king before its term could end. All Nepalese citizens 18 years and older became eligible to vote. Nepal's military consists of the Nepalese Army which includes the Nepalese Army Air Service, (the air force unit under it), and the Nepalese Police Force. On May 19, 2006 The House unanimously passed the proposal to rename Royal Nepal Army (RNA) as the “Nepali Army”. Service is voluntary and the minimum age for enlistment is 18 years. Nepal spends $99.2 million (2004) on its military—1.5% of its GDP. The Nepali Army has 90,000 soldiers, who are currently engaged in the civil war against the Maoist insurgents. Nepal has close ties with both of its neighbours, India and China. In accordance with a long-standing treaty, Indian and Nepalese citizens may travel to each others' countries without a passport or visa. Nepalese citizens may work in India without legal restriction. Although Nepal and India typically have close ties, from time to time Nepal becomes caught up in the problematic Sino-Indian relationship. India considers Nepal as part of its realm of influence, and views Chinese aid with concern. Some Indians consider Nepal to be part of a greater pan-Indian state, an attitude that has caused Nepalese antagonism towards India.Moreover,there is a growing anti-indian sentiment among Nepali youths. In 2005, after King Gyanendra took over, Nepalese relations with India, the U.S., and the UK have worsened. These three foreign countries have been vociferous opponents to the crackdown on civil liberties in Nepal. China mainly seeks cooperation with Nepal on the issue of Tibetan independence, including the degree of freedom that Nepal gives the thousands of Tibetan refugees living in its territory and the approximately 2,000-3,000 Tibetans that seek to escape Tibet through Nepal each year. Outside of Asia, Nepal has especially friendly relations with Germany,Japan and has historical military links with the United Kingdom. Nepal has a total population of 27,676,547 as of July 2005, with a growth rate of 2.2%. 39% of the population is up to 14 years old, 57.3% are aged between 15 and 64, and 3.7% above 65. The median age is 20.07 (19.91 for males and 20.24 for females). There are 1,060 males for every 1,000 females. Life expectancy is 59.8 years (60.9 for males and 59.5 for females). Nepal is the only country in the world where males outlive females. Total literacy rate is 53.74% (68.51% for males and 42.49% for females). 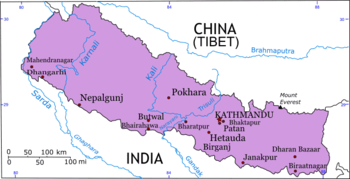 Nepali culture is influenced by the cultures of Tibet, which borders to the north, and India, which borders to the south. There are similarities in clothing, language and food. A typical Nepali meal is dal-bhat - boiled dal served with rice and vegetables, and some spicy relish. This is consumed twice daily, once in the morning and again after sunset. Between these main meals, snacks such as chiura (beaten rice) and tea are consumed. Meat, eggs, and fish are considered a treat and eaten on special occasions only. In the mountainous region the staple diet are based on wheat, maize, millet and potatoes. Millet-based alcoholic drinks known as " Tongba" and other cereal based alcohol are popular, including chhaang and the distilled rakshi. However, the Newar community enjoys its own special Newari cuisine. The sarangi, a four-stringed, hand-carved instrument is usually played by wandering minstrels. Since the sixties, Nepali rock or rock music, sung to Nepali lyrics, has become popular among youth. Also catching on fast is Nepali rap and Nepali reggae which has blossomed with the advent of the music video industry. There are also many heavy metal bands. Football is the most popular sport, followed by cricket and kabaddi. The Martyrs Memorial Football League is the national football championship. Television was only introduced to Nepal in the 1980s. Currently there are four television broadcasting channels: Nepal Television - the national television channel; NTV 2 Metro - a city channel owned by the government; and two private channels - Kantipur Television and Image Channel. Also many other networks, particularly those that originate in India, are available with the installation of increasingly popular satellite dishes, although lack of electrification makes this difficult. Radio is listened to throughout the kingdom; as of 2000, there were 12 radio stations. 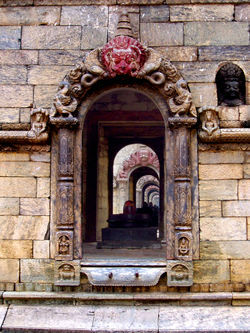 The Nepali year begins in mid-April and is divided into 12 months. Saturday is the official weekly day of rest. Main holidays include the National Day (birthday of the late king Tribhuvan) December 28, Prithvi Jayanti, ( January 11), and Martyr's Day ( February 18) and a mix of Hindu and Buddhist festivals such as Teej, Dashai in autumn, and Tihar late autumn. Most marriages are arranged, and divorce is rare. Polygamy is banned by law; relatively isolated tribes in the north, such as the Dolpo, practise polyandry. Nepal has a rich tradition of ceremonies, such as nwaran (the christening of a child), and the Pasni, the day a child is first fed rice, and bratabandha (the penance ceremony) and gupha for prepubescent boys and girls, respectively. In bel bibaha, preadolescent girls are "married" to the bel fruit tree, ensuring that the girl becomes and remains fertile. 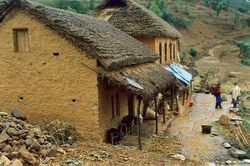 Most houses in rural Nepal are made up of a tight bamboo framework with mud and cow- dung walls. These dwellings remain cool in summers and retain warmth in the winter. Dwellings at higher altitudes are mostly timber-based. Woman's status in Nepal has been steadily rising. The first lady to have gained the prestigious chartered accountant status is Samikshya Shrestha in August 2004.